NEAR THE EDGE of California’s Delta where the pavement turns to gravel before disappearing into native grasslands, University of California, Davis, veterinarian Eric Davis and his wife, Cindy, live with three horses, five donkeys, a pair of scrappy Chihuahuas and a pond-full of koi. Each year, the couple makes three trips to Mexico and two to Nicaragua to support local veterinarians and care for donkeys, or burros, still heavily used for transporting goods and people. Summers find them visiting Native American reservations across North and South Dakota to treat horses that otherwise have no access to veterinary care. Eric has made the trip to the Dakotas more than 20 times, with Cindy aboard for 15 of them. Each journey also introduces veterinary students from UC Davis and across the United States to the needs of underserved, rural communities and allows them to practice critical, hands-on skills first introduced in vet school. Students unload the bus at the Pow-Wow Grounds in Little Eagle, SD on the Standing Rock Sioux Reservation. Local horse owners from the area met the group there for animal treatment. Photo by Joe Proudman / UC Davis. On a hot, late-spring day, Eric, who teaches in the School of Veterinary Medicine, and Cindy, a veterinary technician experienced in field anesthesia, were rapidly fitting out their 25-year-old Thomas Built school bus for this year’s trip to the Dakotas. Hand-painted two shades of gray with royal blue trim, the vehicle would once again serve as their summer home and the hub of mobile veterinary clinic. 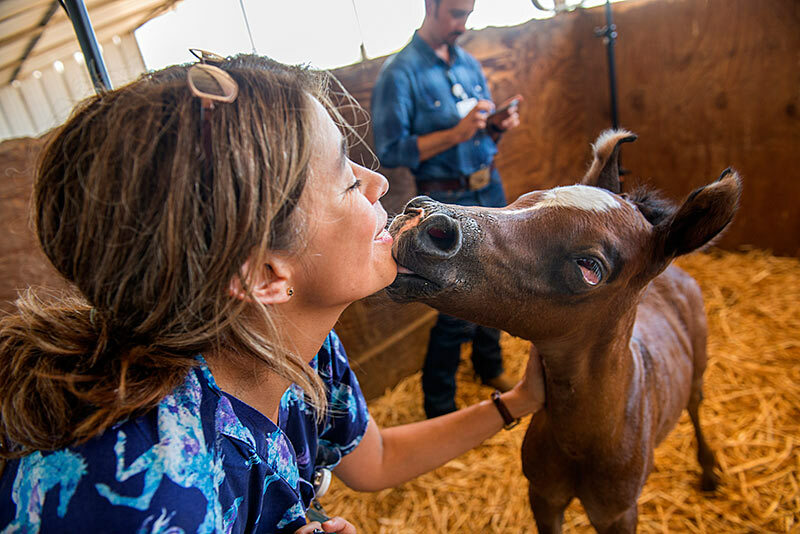 Upon arriving in the Dakotas, he, Cindy and their team of veterinary students tend to cuts, bruises, dental problems and countless castrations of fairly wild, adult horses. UC Davis veterinary student, Olivia Stonehouse, inspects the teeth of a horse at the McLaughlin Rodeo Grounds in McLaughlin, SD. Photo by Joe Proudman / UC Davis. Eric Davis, a UC Davis veterinarian, and Tarek Isham, a UC Davis veterinary student, perform a quick surgery in Little Eagle, SD. Photo by Joe Proudman / UC Davis. When Eric began visiting the Dakotas in the early ‘90s, he arrived to find that one Native American ranching family had 300 un-castrated colts in need of his surgical skills. Each subsequent trip has been a bit different but long, exhausting days have been a constant. “I have literally been in the New Town rodeo arena in North Dakota at 2 a.m., castrating a horse by the light of a headlamp,” he said. Because they would be so far away for so long, and dealing with so many unexpected variables, they spent three weeks in concentrated preparation for the Dakotas trip. But for Cindy, coordinating the logistics for all of their domestic and international trips has become a fulltime, year-round job. Taylor Brown Otter, 15, left, and Athaliah White Eagle, 13, right, wait for their horses to be treated in Bullhead, SD. Photo by Joe Proudman / UC Davis. Meticulous packing is always critical for the bus trips to the Dakotas, some 1,300 miles away. Their cargo ranged from a dozen plastic bins with snap-on lids, tool chests and a super-sized metal water jug to a lariat for roping horses, a mobile ultrasound unit, liquid nitrogen for biopsying tumors and, of course, the indispensable dart gun. “You hope you don’t have to use it but some of the horses are so wild, they’ll go over a 7-foot fence,” Eric said. Last year he had to dart five horses with sedatives in order to treat them. Andria Lessler, a UC Davis veterinary student, works to gain the trust of a horse before inspecting its teeth in McLaughlin, SD. Photo by Joe Proudman / UC Davis. UC Davis veterinary students, Tarek Isham and Andria Lessler, work on the hooves of a horse in Little Eagle, SD. Photo by Joe Proudman / UC Davis. Starting out his career as a farrier, Eric came to UC Davis in 1967, earning a bachelor’s degree in animal science in ‘71, a master’s in ’72 and a doctor of veterinary medicine in ’77. After working for a decade in private veterinary practice, he returned in ’87 for a two-year residency in equine medicine. Having served at three other universities and with two rural veterinary outreach programs, he again returned to UC Davis in 2008 to teach and work with the veterinary school’s International Animal Welfare Institute. He and Cindy also have founded the non-profit RVETS, or Rural Veterinary Education, Teaching and Service, through which they coordinate their trips to the Dakotas and Central America. Eric Davis inspects a horse before treating it in Bullhead, SD. Photo by Joe Proudman / UC Davis. Eric is experienced in treating horses, donkeys and mules, but has a soft spot in his heart for the donkeys that continue to be beasts of burden in the remote regions of the developing world. They are exquisitely adapted to the desert environment and its sparse vegetation. In general, they are in better health than most pet donkeys in the United States, he said. In the Dakotas, however, where the prairie and sky seem to race out to meet at the horizon, the expansive grasslands are too rich for a donkey diet and far better suited for horses. Natural resources are abundant there but names like Little Big Horn, Wounded Knee, Pine Ridge, and Standing Rock speak of the region’s history of conflict and heartbreak for Native Americans. Today, many of the surrounding counties are among the poorest in the U.S. The rural horse owners are committed to their animals but lack resources to pay for veterinary care, which is scarce, at best, in these sparsely populated regions. When the Davises and their team of students arrive, clients cover the costs of medication and supplies, but the veterinary team donates their time and labor. For the Davises each trip yields its own rewards, including the satisfaction of training up a new generation of veterinarians. “There are those moments when a student really catches on to things or you can show them how to do something they’ve never seen before,” Eric said. There also is the pure joy of watching the horses in their native, prairie environment. Eric Davis offers tips for Tarek Isham as he trims a horses hoof in Little Eagle, SD. Photo by Joe Proudman / UC Davis. Students prepare to treat a horse in Bullhead, SD. Photo by Joe Proudman / UC Davis. She and Eric hope that their service in the Dakotas yields benefits for UC Davis and its School of Veterinary Medicine. “I can’t overemphasize the importance to our work of having access to the vet school’s analytical laboratory and clinical research faculty,” he said. “In return, I hope I bring back to campus an appreciation of the gap between what is known in veterinary medicine and the veterinary care that is provided in these different parts of the world. 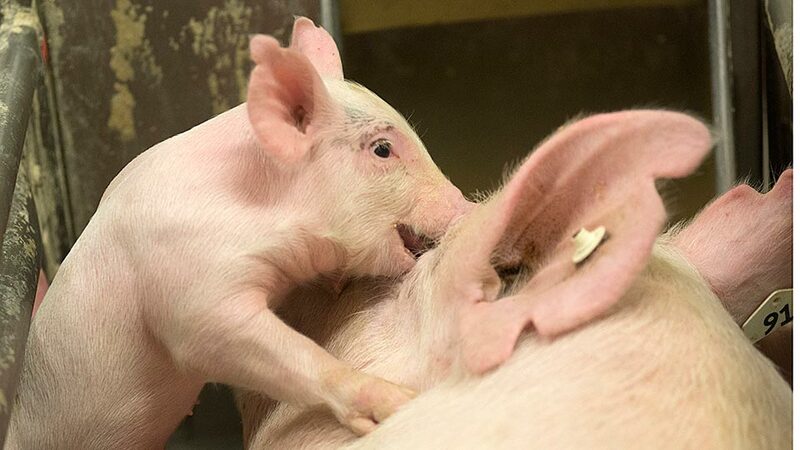 UC Davis animal-cognition expert Kristina Horback is conducting personality tests with 4-week-old female piglets, as part of her pioneering research examining the role personality plays in the welfare and sustainable production of farm animals. 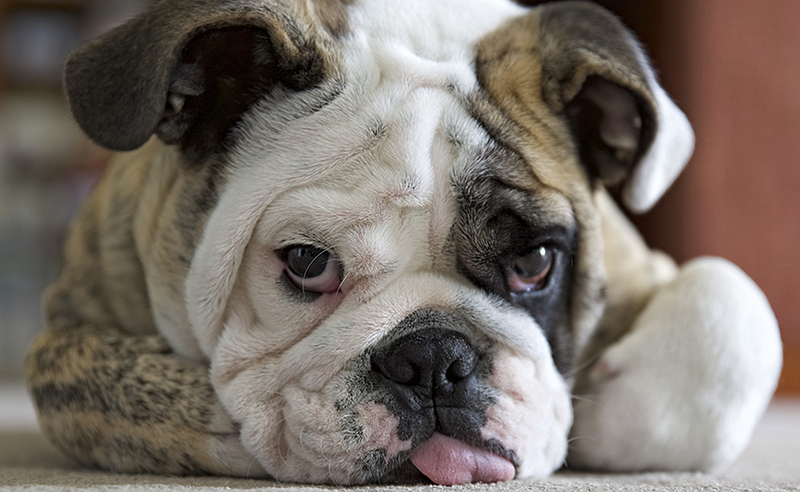 The first broad-based DNA assessment of the English bulldog suggests that the breed may lack sufficient diversity in its gene pool to correct the numerous heritable health problems that are so common in these dogs.